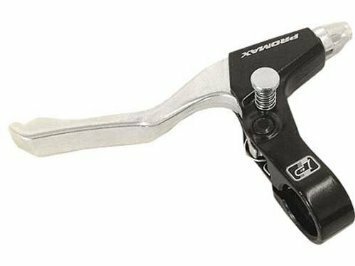 This Promax brake lever set includes a standard left hand brake lever and a locking right hand brake lever. The lock acts as a parking brake. Just press the button and you won't have to worry about your trike rolling away. This eliminates the need for the velcro strap parking brake that we supply with all trikes. We will install these on new trike orders for a fee or if you already have your trike we can ship the set to you aftermarket. To set the parking brake, just squeeze the brake lever, press the button and release the lever. To disengage, simply squeeze the the brake lever again and the locking portion releases. If you have any questions about this product by TerraTrike, contact us by completing and submitting the form below. If you are looking for a specif part number, please include it with your message.